The EURUSD remains range-bound (oscillating) between 1.2140 key support and key resistance up near 1.2540 area. 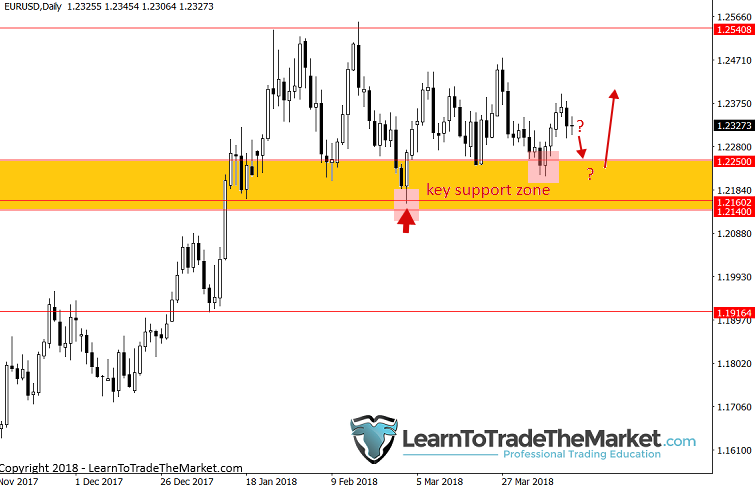 Last week, we were watching for a retrace back to support to be a buyer and we mentioned the near-term level at 1.2250 down to 1.2140 as a potential buy-zone. We can see that price did bounce up from that 1.2250 level last week before pulling back again slightly into the week’s close. Our views this week remain similar; we can look to buy within the support zone from 1.2250 – 1.2140 as the existing overall trend is up. Ideally, we would buy on a clear price action buy signal and we are looking to ride the market up to the upper end of the range near 1.2540. 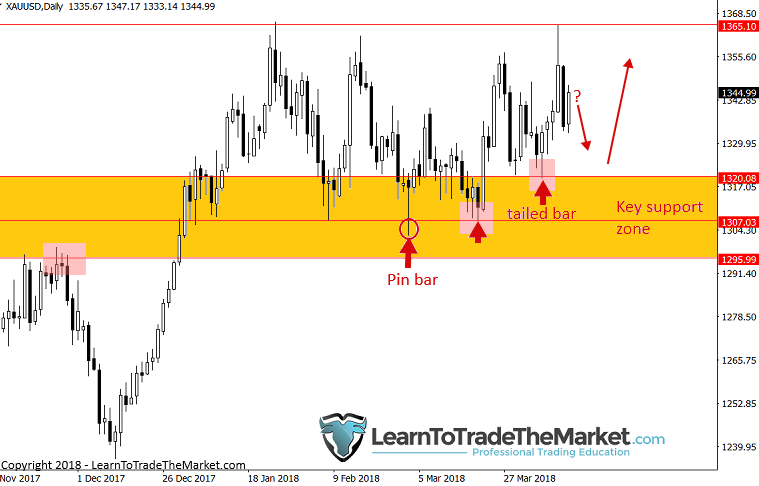 Gold surged higher last week, testing key resistance up near 1360 following our April 9th commentary in which we discussed looking to buy this market. We still see Gold in a trading range between 1365 and 1307 / 1295 support area, but the underlying trend is up and so we are looking to buy as we have been for months. As with recent weeks, we continue to call Gold a long and see buying opportunities on weakness around 1307 to 1320. Watch for price action buy signals on a pullback to that 1320 – 1307 support area this week and target resistance up near 1365. 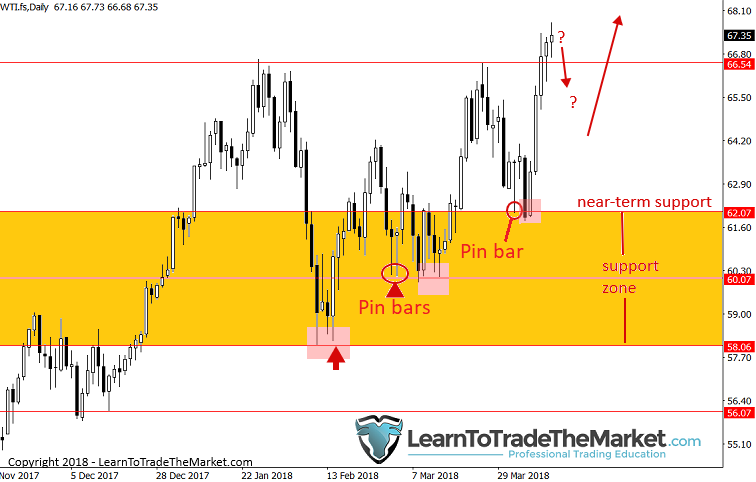 Last week, Crude Oil exploded higher as it reversed at 62.00 area support, which was also the location of a bullish pin bar from April 4th, which we discussed as a buy signal in our daily members market commentary that day. Crude Oil remains in a long-term uptrend but it is being interrupted by large downward retraces / swings back to support. Thus, we will look to get long again, for anyone who missed the last entry, by watching for a pullback to support and another clear price action entry signal. The close above 66.55 key resistance late last week as another sign bulls are very much in control here, so traders may want to watch the 1 hour and 4 hour chart for a small pullback in addition to the daily chart for buy signals this week on weakness / pullbacks. Last week saw price float slightly higher in a slow grind following the recent volatility we have seen in this market. The US market remains in a long-term bull market despite recent price weakness and the recent extreme selling we saw several weeks ago. Price has bounced aggressively from 2530 support area on recent pullbacks to it, so we are continuing to watch that area for buy signals as price consolidates just above it. 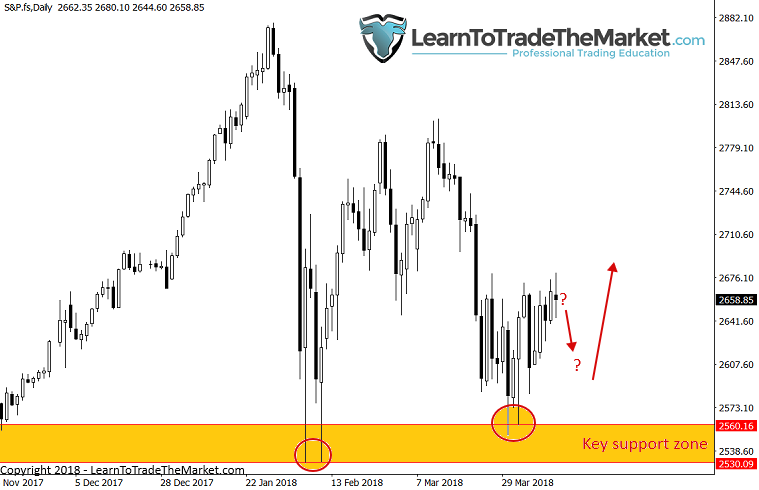 This week, we will be watching the support between 2560 – 2530 for buy signals or potentially even a blind entry there if price pulls back right to that zone.